Flat-panel TVs with 30 channels of HD programming. Easy-access Plug-and-Play feature makes it simple to connect electronics. 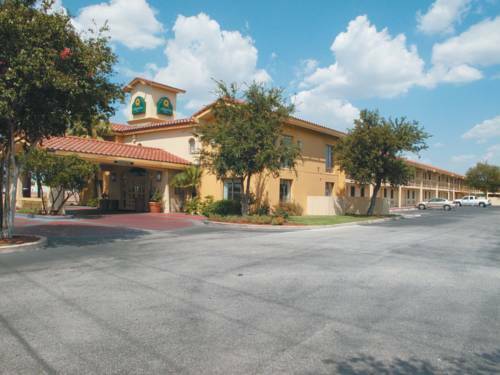 The La Quinta Inn San Antonio I-35 N at Rittman Rd is centrally located just North of downtown San Antonio near popular venues, arenas, and attractions such as the AT&T Center, Freeman Coliseum, River Walk, and The Alamo. We are just minutes away from the military facilities of Fort Sam Houston and Brooks Army Medical Center. We are also just a short distance from theme parks including Splashtown, SeaWorld, and Six Flags Fiesta Texas. There are several restaurants, cocktail lounges, and shopping malls in the area. Our staff can assist you with city tours, directions to local attractions, and reservations for local events. We offer a Free Bright Side BreakfastTM that includes waffles, cold and hot cereal, breads, fruit, yogurt, juice, and coffee. You'll enjoy free wireless high-speed Internet access, a coffee maker, hair dryer, and more in each guest room. This hotel is pet-friendly. All reservations must be cancelled before 6pm local hotel time on the scheduled date of arrival to avoid being charged a penalty of one night's room rate and all taxes.